For years now, I have been trading with a 5-minute countdown timer. When it counts down to zero it sets off a buzzer before resetting and starting again. (1) It brings my focus back to the markets, in the event that it's slipped away (not unusual given that I trade overnight). (2) It reminds me to carry out a process checklist which cycles through various aspects of higher and trading timeframe analysis. The aim here is to maintain some "bigger picture" situational awareness. The buzzer has become such a common occurrence that it tends to slip into the background of my awareness. Especially if I'm getting tired. I effectively just IGNORE it. So here's a little hack. It's an idea I got from the TV show "Lost". In "Lost" there is a countdown timer that must be reset every 108 minutes, otherwise the world ends. The important difference is that this timer must be reset BEFORE it hits zero. It's not reset AFTER reaching zero, like my little timer. So what if I did the same thing? What if my intent was to complete my regular "situational awareness" routine and manually reset the timer BEFORE it hits zero, or else the world ends and we all die in a fiery inferno? Disclaimer: The world doesn't really end. It's just a game! Sounds good so far. Apart from the dying bit. The results have been tremendous. Simply shifting my intent from "taking action AFTER the buzzer goes off" to "taking action BEFORE the buzzer goes off… or else everyone dies", has dramatically improved my consistency. It's turned the process into a game. Into a bit of fun. I can maintain a higher state of focus for most of my trading session. And it REALLY annoys me when I slip up and let it hit zero. 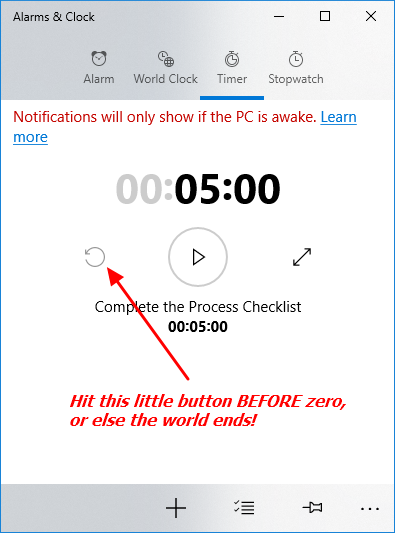 Particularly because I changed to the standard Windows-10 Alarms & Clock app. When it hits zero it sounds an alarm and displays a pop-up notification, and DOESN'T STOP until I manually stop it. It's damn annoying. If you also struggle with consistency in applying regular routines or procedures, consider trying this little hack. It kind of adds to the enjoyment of the day. But more importantly… it seems to work. Give it a try. Reset that timer. And help me keep the world safe. I am your long time follower. And everything technical i learned was from your youtube and posts. Now I quote your quotations in my conversations. I use my iPhone alarm it buzzes ever 3.48 hours just before H4 closes and new H4 candle arrives. A 3.48 hour timer. Ha ha. I love it. Great work. I trade Dow and Nasdaq futures sometimes major forex pairs, Crude and Brent using my automated trading EAs. Important hours and times for me are 12, 4, 8 then 9:30, 10, 12, 16 Eastern. Sorry Forget to say big thank you and anything you need done for MT4, i am here for you. No charge!